REAL LEADS FOR REAL ESTATE. Real estate agents and companies are the ultimate marketers. They post signs at their properties and elsewhere all over the area for drivebys, host people at open houses, and are huge networkers. So when someone sees your ad, visits the property, or talk to you, make it count! Revenue Typhoon for Real Estate does exactly that. A phone number is ok ... for when you personally can take the call. A web site works ... only when someone is online at their computer. In comparison our marketing and mobile system enables potential buyers to reach you any time of the day or night the way they want, whether via text, web, or even phone. Once they do, we capture their contact info and initiate autoresponse campaigns that respond via email, text, or voice, such as for the campaigns below. LIVE DIRECT RESPONSE. Thousands pass your signs. But how many actually remember to contact you or look you up? 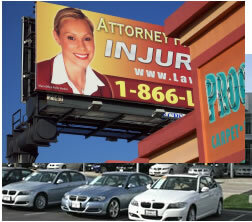 Turn your signs into lead magnets with simple text signup, a great offer, and immediate text and email response. NEW LISTINGS. Sure, you can post new listings on your web site and send them via email. But only 12% of emails are read today. Why not use a channel that's immediate, personal, and virtually everyone is guaranteed to read? Share your new listings through a text broadcast. LET THE HOUSE TRULY SELL ITSELF. Create an individual campaign for each property and post it on the yard sign and any where you promote it. When people text you they get house details via text (summary) and email (detail, sell sheet document), plus regular reminders or notices (price reduction, pending sale, house sold with sales price). You have their contact info to personally call, text, or email. HOUSE LAUNCH. Make it a big event for agents and buyers. Use email for full updates and text broadcasts to announce each launch. REFERRAL CAMPAIGN. Offer your contacts a gift for each referral. See the demo - text your name, email, and the number 92873 to +1 (858) 598-3980. This campaign includes both SMS and text reminders at one and two months. PROSPECTING WITH OFFER. Offer prospective home buyers or sellers a free gift when they meet you for a consultation. See the demo - text your name, email, and the number 92901 to +1 (858) 598-3980. Includes several text and email reminders to remind recipients to claim their free gift. All campaigns include a web landing page for PC-based signups. Offers can be whatever makes sense for the campaign, your business and the value desired, such as a Local Buyer's Guide for new subscribers, Home Design Guide for a consultation. and gift card for a referral. THE POWER OF DATA. Have a realty franchise or company? Leverage it, for example, to aggregate leads. Then when a new listing comes in you have a targeted audience to share it with. We'll search your database and send a text alert to RE clients and prospects looking for that type of property in that area.